Veeam Endpoint Backup FREE is here! A couple of months ago, we announced a new solution called Veeam Endpoint Backup FREE. In December, we released the beta version of this software to the world. The interest in this beta software was overwhelming and we had a huge amount of testers, with more than 22,000 registered users and almost 20,000 downloads of our beta. Today, we are proud to announce the GA (general availability) of Veeam Endpoint Backup FREE! 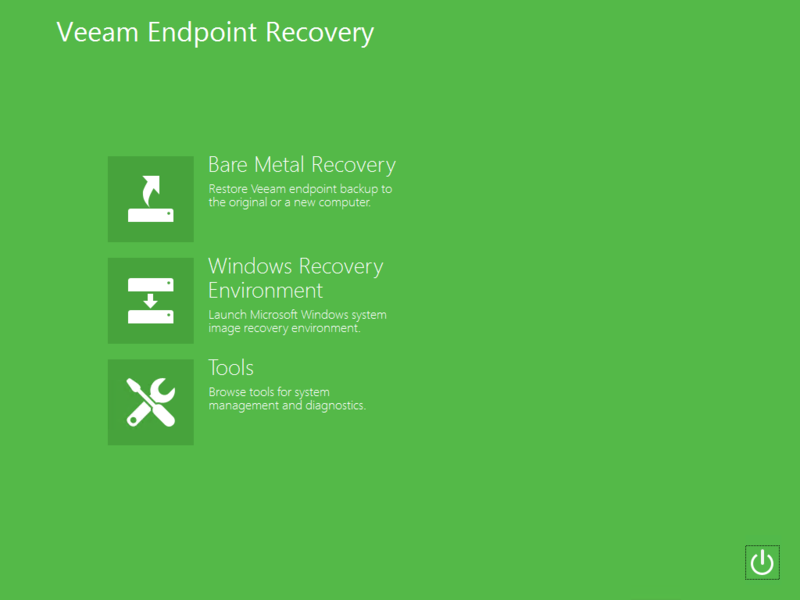 Veeam Endpoint Backup FREE is a standalone solution that helps you protect Windows endpoints. It is a data-protection and disaster-recovery solution for physical machines (endpoints). Protecting an entire endpoint, protecting specific volumes or individual folders are all possibilities with Veeam Endpoint Backup FREE. As always, though, while protecting your data may be one thing, it’s the restore and the restore possibilities that matter! Veeam Endpoint Backup FREE supports Microsoft Windows 7 SP1 or later, and Microsoft Windows Server 2008 R2 SP1 or later (up to Windows 8.1 and Windows 2012 R2). And the best part? It is completely free! Veeam Endpoint Backup FREE is an image-level backup tool that stores backups in the VBK format already familiar to Veeam Backup & Replication™ users. What makes it unique though, is being able to perform a forever incremental backup without requiring a changed block tracking (CBT) file system driver. This really helps with stability for typical endpoints, which usually have tons of potentially conflicting third-party software installed, while still providing great incremental backup performance. 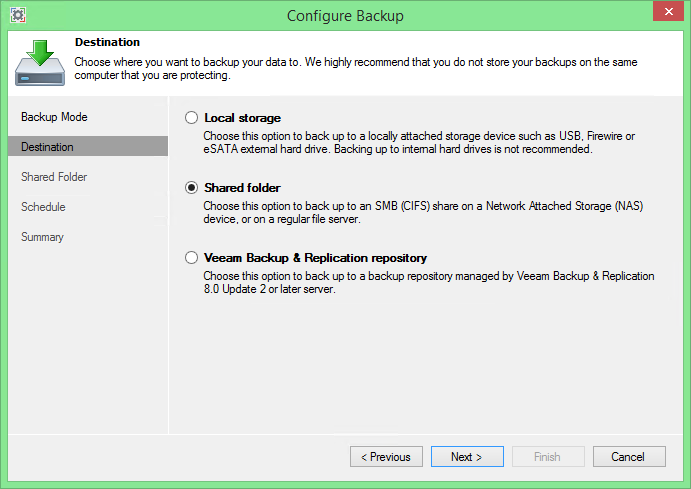 There are two backup types available in Veeam Endpoint Backup FREE. A volume-level backup, which can be the entire endpoint, or selected volumes and a file-level backup. Volume-level backup protects all data or content on specified volumes and is generally faster than backing up the same data at a file-level. 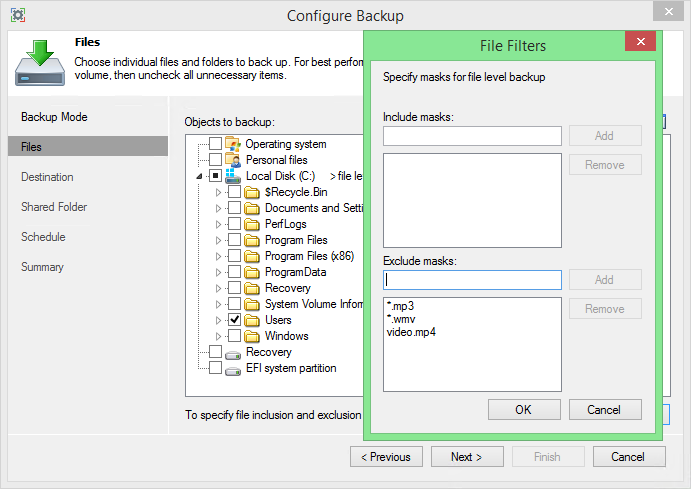 File-level backup, however, allows you to select individual files and folders to backup and includes the possibility of adding file masks for exclusions or inclusions. Regardless of which option you choose, the resulting backup will be in the form of an image that contains the data you’ve selected for protection. You can save your backups to different type of locations such as removable storage devices, network shares or a Veeam Backup repository. NOTE: You’ll need Veeam Backup & Replication v8 Update 2 for this option which will be available in April. 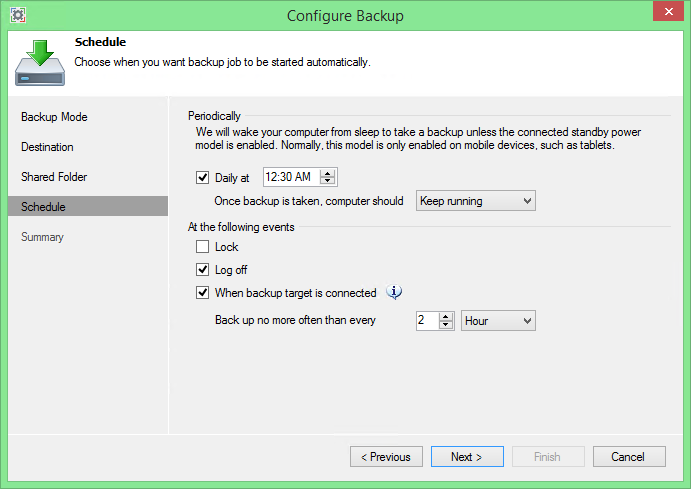 There are a few more settings that you can define while configuring your backup policy through the wizard. One of the important items is how long you want to keep your restore points. NOTE: The wizard will keep your restore points during the chosen amount of days, but only when the computer was powered on. This means that if you decided to keep 5 restore points, but took a vacation and shut down your computer for 10 days, your previous restore points will not be removed because they were older than 5 days! You will always have 5 days of restore points, which could be far more than 5 restore points, depending on your schedule and if your computer was turned on! And speaking of schedules, they are very flexible. First, we support a daily backup (and we will even wake up your computer to take one, and then put it back to sleep – or shut it down – if you chose to do so). Additionally, Veeam Endpoint Backup provides a unique ability to execute backup at specific events such as at lock, at log off, and when backup storage is connected. You can also limit the frequency of backup, as some of the triggers– such as computer lock – can happen a few times every hour. After configuration, your first backup will be a full backup, and every other backup will be an incremental backup (unless you chose the standalone full backup option to perform an ad hoc backup). Veeam Endpoint Backup FREE supports a huge variety of granular restore options. First, you can perform volume-level restore or file-level restore. Note that you can always use file-level restore, even when you have performed a volume-level backup, BUT you can’t perform a volume-level restore when you have selected a file-level backup. Volume-level backup will allow you to restore an entire volume to the same or new location, but it has a few limitations. You cannot restore the system volume to its original location when the windows operating system is running. To restore the system volume or an entire computer, you will need to boot into the recovery environment first (read on). File-level restore will mount the backup and open the built-in Veeam Backup Browser so you can restore your files easily. You can export physical disk contents from your backup into VMDK, VHD and VHDX disk files. Whether you are protecting volumes or your entire computer, you will certainly benefit from the recovery appliance. Veeam Endpoint Backup FREE allows you to create a recovery image of your computer on different kinds of media such as USB flash drives, SD cards, CD, DVD, BD, ISO images and more. Veeam Recovery Media can then boot your computer with a Windows RE running from the bootable media, and NOT the one on your computer. At that time, you can restore an entire computer or specific volumes from your backups. The coolest part about this Veeam Recovery Media is that it includes the drivers installed on your computer when creating the media and that you have the possibility to add drivers whenever necessary. The network and storage drivers will be then automatically loaded when starting the recovery environment, which will make the restore process as smooth as possible. If the recovery media does not include your required drivers, you can, of course, manually load drivers as you go. But Veeam Endpoint Backup FREE doesn’t stop here! We’ve included the image-based recovery tool to allow you to restore a computer system image that’s been created with the built-in Microsoft Windows tools and an entire section with handy utilities for advanced computer administration. These are tools such as the local-user account password-reset tool or a memory diagnostic utility. And on top of that, we have included a very simple procedure to submit an issue: you can do that with just a few clicks within the product’s control panel. After registering your email the first time (only need to do this once), you can start submitting your issues and our system will also automatically collect and upload the Veeam Endpoint Backup logs for your convenience. If you are running Veeam Backup & Replication, you will be able to choose a Veeam Backup & Replication repository as a backup location. This unlocks some great functionality. Through the Veeam Backup & Replication server, you will be able to perform monitoring of all incoming endpoint backup jobs, and receive email notifications for your endpoint job statuses. We also provide basic endpoint job management capabilities, such as enabling or disabling certain endpoint backup jobs, or managing access to your backup repository by setting the permissions on the corresponding repository for individual users and groups. Storing backups in Veeam backup repositories also adds a few important features related to data loss avoidance. For example, you can encrypt your backups stored in a Veeam backup repository, or send your endpoint backups to tape or offsite through Backup to Tape and Backup Copy jobs, respectively. And if you want automated offsite protection, but do not have your own DR site, Veeam Backup & Replication v8 U2 fully supports Backup Copy of endpoint backups to a Veeam Cloud Connect partner of your choice. For more information, join us on April 30th or watch the video.